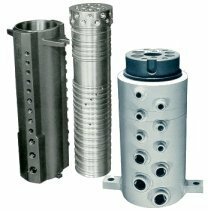 We produce a variety of hydraulic swivels and valves for many different applications. If you need more information about any of the swivels and valves seen below, contact us. Twenty-four port tube and manifold set, tube-bored and honed. Available in nickel or chrome plated. Finished, assembled, and pressure tested swivel set. Machine ductile manifold adjacent to 12 port swivel set featuring nickel-plated gray iron tube and "Durion-coated" ductile iron manifold for "complementary metal" service. Steering valve permits flows to 20 gpm and pressures to 3000 psi. Typical relief valves; 4000 psi maximum operating pressure; flows to 200 gpm. Directional control valve features flow to 40 gpm at 3000 psi. Copyright 2000, United Hydraulics, Inc. Wickliffe, Ohio USA. All Rights Reserved.